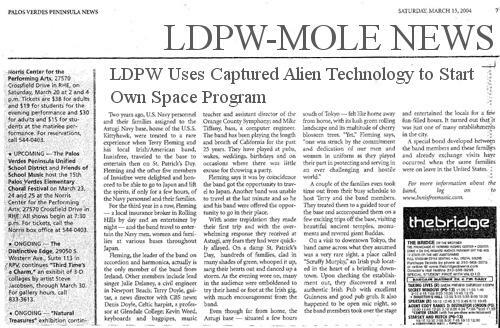 World reaction to the news that the Linden Department of Public Works (LDPW) is using reverse-engineered alien technology has been swift, rising from the ground roots and spreading even to leading newspaper editorial pages. Here's a sampling of images sent to this reporter from several tens of sources. 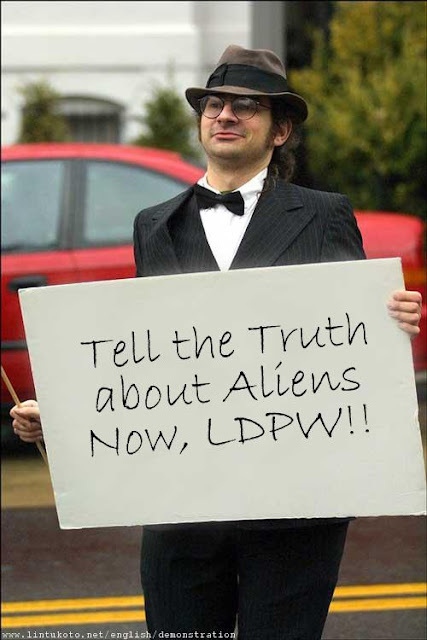 Jason "Binks" Harthrowb has given up his usual "The End is Nigh" sign to join the call for full disclosure from the LDPW about their activities. Normally crackpot-oriented newspapers are garnering new credibility by reprinting the original story without proper and due attribution. 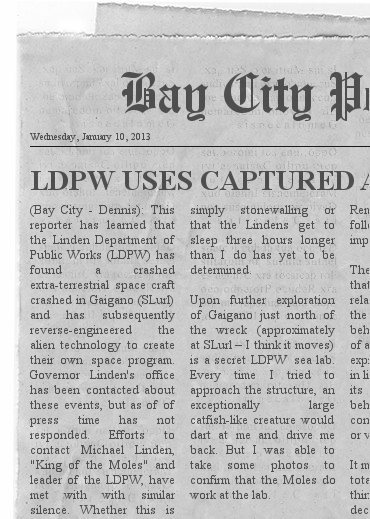 Readers claim the hyperlinks in these treeware editions don't work and speculate about LDPW interference. Information is even being secreted into lunches delivered to Poultry Report Headquarters. Major newspapers are so anxious to make deadlines that they have been splashing the news across broad headlines over unrelated stories. 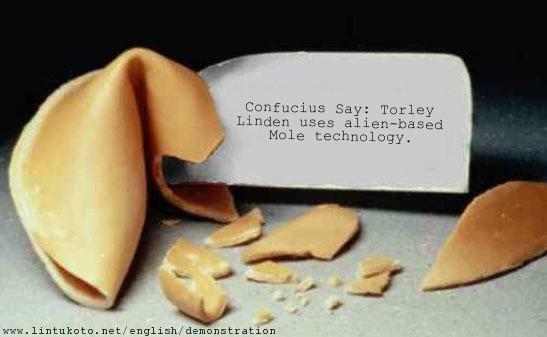 Major Technologists are being outed by underpaid Human Resources Directors. 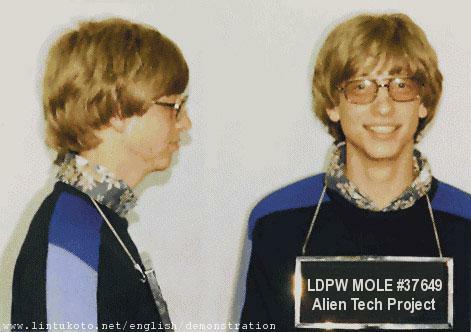 Pictured here is a young Bill Gates during his Pre-Microsoft internship at the LDPW. 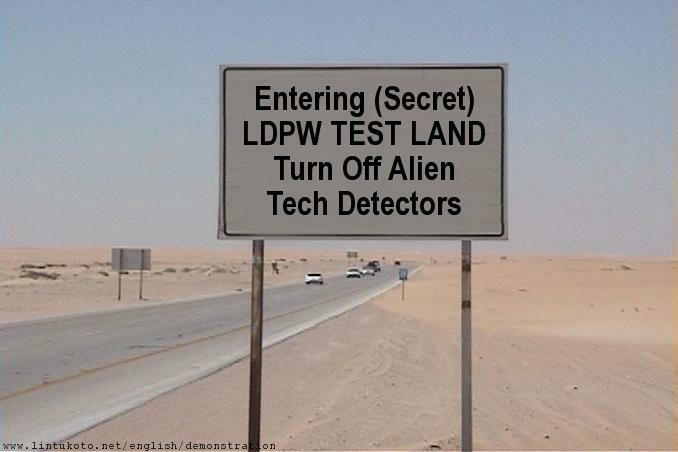 Indications of cover ups at LDPW facilities are being found. Protests have spread like melted butter even in small towns like Dixville Notch, New Hampshire where the normally 12-person population swelled eleventy-fold over night. Crowd sizes have shown no sign of stabilizing but growth has slowed to a warm maple syrup pace. Officials hope a molasses in winter pace occurs soon or they may have to think about a committee to discuss possible reaction, perhaps over breakfast or a late brunch.